There is no doubt about the enchanting beauty of hill stations- Ooty and Kodaikanal, equally entrancing is the charm of cultural capital Mysore. A tour where you can explore the historical richness of Mysore, as well as relax amid the scenic beauty of Ooty and Kodaikanal is nothing less than a dream travel. However, the time and planning for combining three destinations in a single tour can be often stressful. The easiest way to plan your travel is by choosing a Mysore Ooty Kodaikanal Tour Package. Holidays DNA, at www.mysoretourism.travel which is one of its parts, offers an extensive range of tour packages for Mysore Ooty and Kodaikanal. Our travel experts have designed a wide variety of tour packages catering to all kind of holidaying ideas such as honeymoon, family trip, college tour, solo travel and group tour. One can choose from our list of Mysore Ooty Kodaikanal tour packages depending on their budget and requirements. Whether you are travelling on a budget or looking for a luxury holiday, we design tour packages exactly as per your demand. We also make customized tour packages for our travelers. What makes our tour packages even better is the timely and quality centric service of travel executives. Along with personalized assistance in every way possible throughout your tour from our travel experts, we offer facility of booking travel tickets along with accommodation booking, taxi for sightseeing and guides. We try our level best to make your travel memorable and stress free. Kodai Lake- A man-made lake in the shape of a star, Kodai Lake is undeniably one of the most stunning lakes in Kodaikanal. It is spread over an area of 60 acres, and was built by Sir Vere Henry Levinge, former District Collector of Madurai. Facilities of boating and pony rides are offered here. Coakers Walk-it is stretch of 1 km long pathway, which offers spectacular view of the hills. Built on the slope of a hillock, it is bestowed with scenic beauty. It is a popular location for a relaxed walk amid natural setting. Berijam Lake- Located 21 km away from Kodaikanal; this lake is about 3 km long. An ideal picnic spot, people come here to spend some quiet relaxed time with their loved ones, with serene surroundings around. Waterfalls- Kodaikanal is famous of mesmerising waterfalls. Bear Shola falls, at distance of only 2 km from Kodai Lake are the most popular waterfall here. Silver Cascade Falls which falls from a height of 180 feet is another popular waterfall. Thalaiyar Falls and Pambar Falls are two other prominent falls. Dolphin’s Nose- A flat projecting rock at a distance of 8 km from Kodai Lake, Dolphin’s Nose offers captivating view of the surrounding area. The route to this rock is through steep trail which make for an exciting trekking. Doddabetta It is highest peak in Nilgiris, which is popular for the breathtaking view it offers. It is also famous among adventure seekers for its challenging trekking trails. The telescope house at the peak let's visit have a better view of the valley around. Avalanche Lake- Situated in the Nilgiris, it about 28 km from Ooty. Not only entrancing scenic beauty, this lake is popular for fishing and camping too. It offers a perfect blend of refreshing nature with exciting activities. Ooty Lake- A manmade lake, Ooty Lake was built in the year of 824. It is spread over 65 acres, presenting breathtaking scenic beauty. Facility of boating is also offered at the lake. Ooty Mountain Railway-it was built during the colonial era, in 1908. Ooty mountain railway has been declared as heritage site by UNESCO. Botanical Gardens- at the foothills of Dodabetta peak, botanical gardens are also visited by almost every tourist. These gardens were started in 1848. Spread over an area of 22 hectares, these gardens are rich in wide variety of flora. Mysore Palace- Official Residence of Mysore royals, the present building of Mysore Palace/Mysore Maharaja Palace was built in 1912, in the place of old Mysore palaces. It was constructed by a British architect named Henry Irwin. Brindavan Gardens- Brainchild of Sir Mirza Ismail, the then diwan of Mysore, Brindavan gardens are one of the best terrace gardens in the world. 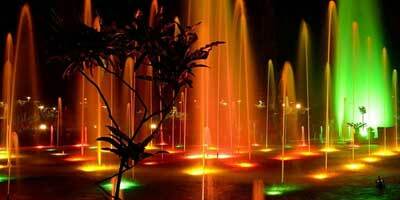 A perfect place for children as well as elder visitors, these garden have beautiful landscapes, wide variety of flowering plants, Botanical Park and fountains which are illuminated in evenings. There is also boating facility. Jaganmohan Palace/ Jayachamarajendra Art Gallery- Jayachamarajendra Art Gallery is one of the best art galleries of India. Jaganmohan Palace converted into this art gallery, was built in 1861 for Mysore royals. This art gallery boasts of more than 2000 rare paintings by famous painters from around the world. The collection here is worth seeing. Tibetian Golden Temple- Built in 1963 by His Holiness Pema Norbu Rinpoche, Tibetan golden Temple is located in Bylakuppe, which is located about 90 km from Mysore. This Tibetan settlement is the second largest outside Tibet. Bestowed with serenity, scenic beauty and spiritual environment, it is a must visit. Mysore Zoo- Bestowed with rich flora and fauna, Mysore Zoo boasts of rare variety of fauna. It is known for assisting in breeding and sustaining of various endangered species which are brought from various parts of the world. It is also popular for the rare variety of birds that can be spotted here.